Difference between revisions of "Triggering interventions"
Interventions (available since the 1.2.1 release) are used to control some aspect of a disease outbreak, down to regional level if desired. Examples include initiating a vaccination program, isolating infected individuals, implementing social distancing, evacuation of a region, shutting down air transportation (for a county, state or a whole country), closing a road or preventing mixing of infected individuals across borders. STEM uses triggers, predicates and modifiers to implement interventions. A trigger contains predicate which, when satisfied, invokes one or more modifiers that changes some aspect of a running simulation. When the predicate is not satisfied any longer, the modified entities are set back to their original values. * Elapsed Time Test - Used to modify some aspect of a scenario after a given period of time has elapsed in a simulation. Observe that predicates are evaluated at each whole time step (e.g. day), and not during each incremental step when using the integrating solver (Runge Kutta). Observe that predicates are evaluated at each whole time step (e.g. day), and not during each incremental or fractional step when using the integrating solver (Runge Kutta). Now we need to determine what we want to modify in the scenario after 30 days have elapsed. Social distancing (e.g. distributing face masks, closing public buildings) reduces the transmissibility of an outbreak, so changing the transmission rate in the disease makes sense. In this case, reducing the transmission rate from 1.3 to 0.3 ensures that the reproductive number falls below 1.0 and the outbreak should be halted. Now we need to determine what we want to modify in the scenario after 30 days have elapsed. Social distancing (e.g. distributing face masks, closing public buildings) reduces the transmissibility of an outbreak, so changing the transmission rate in the disease makes sense. 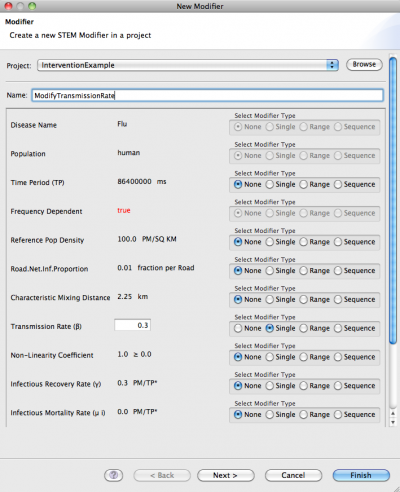 In this hypothetical case, reducing the transmission rate from 1.3 to 0.3 ensures that the reproductive number falls below 1.0 and the outbreak should be halted. The actual magnitude of the transmission rate reduction depends on the policy and the disease (and would take research to discover). When you run the scenario, you'll notice how after 30 days the outbreak is halted. When a developer implements a disease model in STEM, it is up to the developer to determine how vaccinations and isolations should be handled. Currently, for the deterministic SIR and SEIR models, vaccinations move people from the susceptible compartment to the recovered compartment, and isolations move people from the infectious compartment to the recovered compartment. Observe that in a more realistic model, vaccinations and isolations should have compartments of their own. We now have the capability needed to implement interventions at a regional level, but so far no interventions are taking place. Let's say we want to start a mass-vaccination program when the total number of daily cases showing up in Malaysia goes above a threshold, say 100. First, we need to create a new predicate of the type 'Label Value Test'. 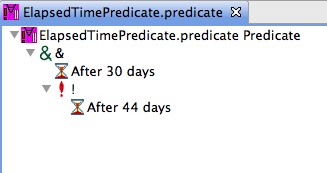 Use the toolbar in STEM to create a new predicate, give it a name (e.g. "TotalIncidenceTest'). 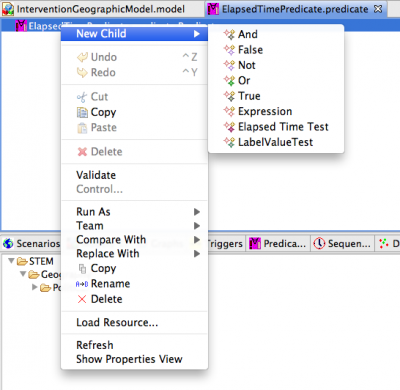 Next, right click on the new predicate, select "New Child", then "LabelValue Test". Select the new "Label Value Test" item in the editor and then open the property sheet. For the Model Name, enter the name of your disease (in this case 'Flu'). 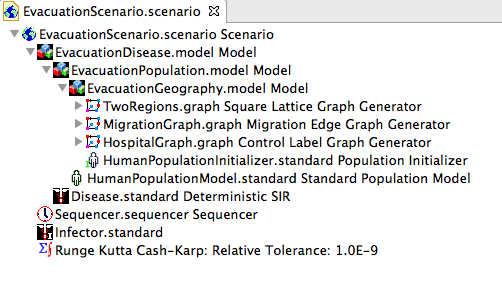 Observe this is the disease name attribute specified in your disease model, not the name of the disease file. 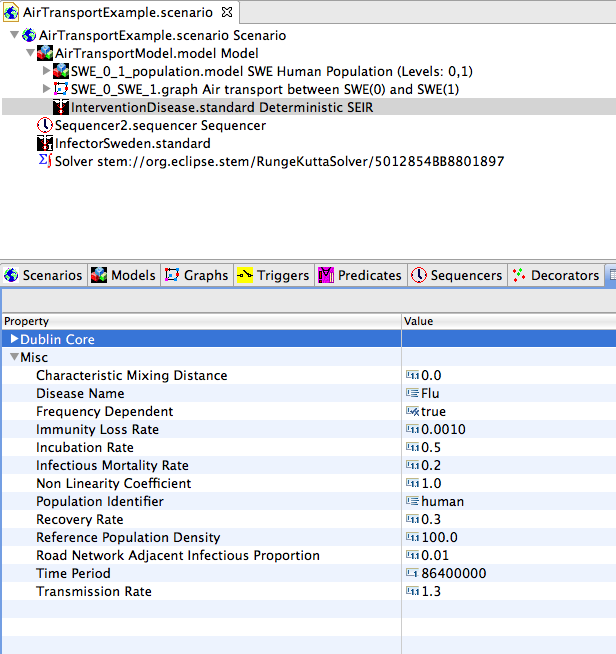 Keep the Population Identifier as 'human', Predicate '>' (can be >, <, >=, <= or =), State 'incidence' (this is the value we want to test), Target URI 'stem://org.eclipse.stem/node/geo/region/MYS' (the URI of the target node, in this case Malaysia. 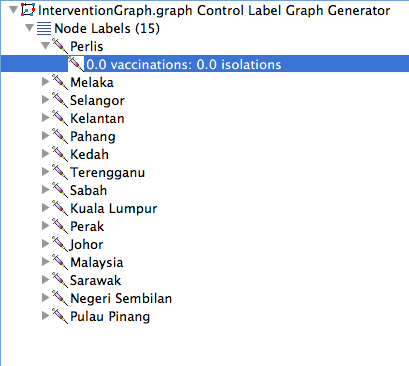 You can find the URI from the Identifier Dublin Core attribute of the node in the graph containing the level 0 node of Malaysia. Keep the threshold at 100. It's also possible to implement periodic vaccination programs (e.g. "vaccination day"). You can accomplish this by creating a "Modulus Time Test" predicate and insert into your trigger. 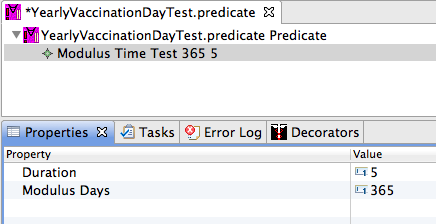 You need to specify two attributes for the Modulus Time Test predicate. "Modulus days" specifies how frequently you want the trigger to be invoked. So if you enter 365 your trigger is invoked every year. "Duration" indicates for how many days after the trigger is invoked to keep invoking the trigger. So if say you enter 5, the trigger will invoke every year for 5 consecutive days. This makes it possible to implement a yearly 5 days vaccination program. In the Period filed you enter the time step used in the file (in ms). 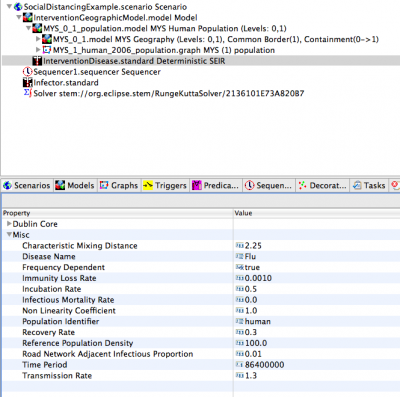 Finally, you indicate whether the data is vaccination data or isolation data as well as whether the file contains fractions of population or absolute counts. 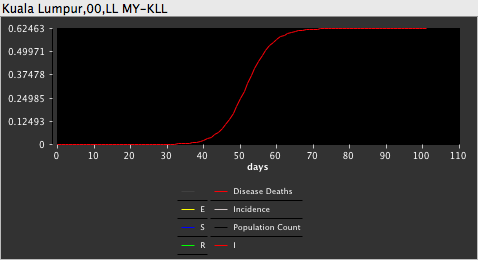 Any disease model that is taking vaccinations or isolations into account will automatically use the data in the generated graph once it's dragged into a model. You can evacuate people from a region by modifying the rate at which people migrate to other regions. 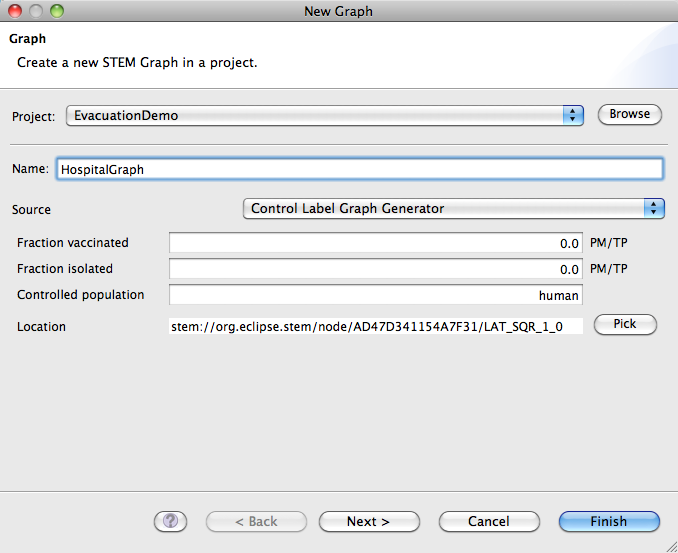 In this example, we will outline the steps to recreate the example scenario you can download here: [[http://www.eclipse.org/stem/download_sample.php?file=EvacuationDemo.zip|here]]. 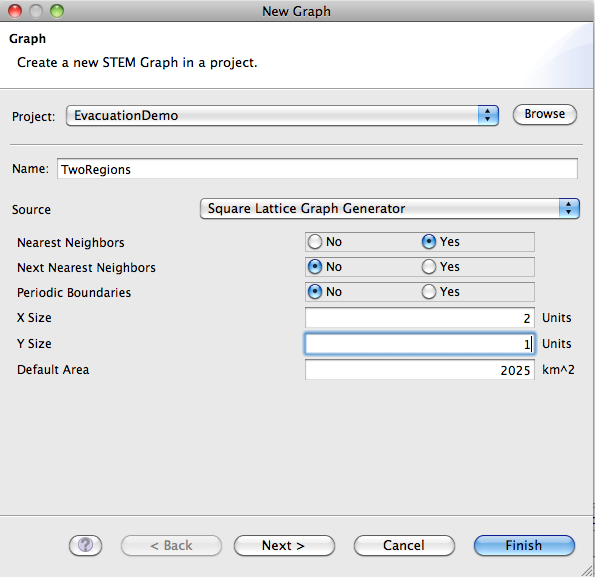 The scenario contains two regions (simple square regions generated by the graph generator) connected via migration edges. One of the regions has a hospital, and a disease outbreak occurs in the region without a hospital. When the daily incidence reaches a critical threshold, the migration rate to the hospital increases and the migration rate to the infected region is set to 0. Also, the daily vaccination rate at the hospital is increased from 50 to 100 vaccinations / day. 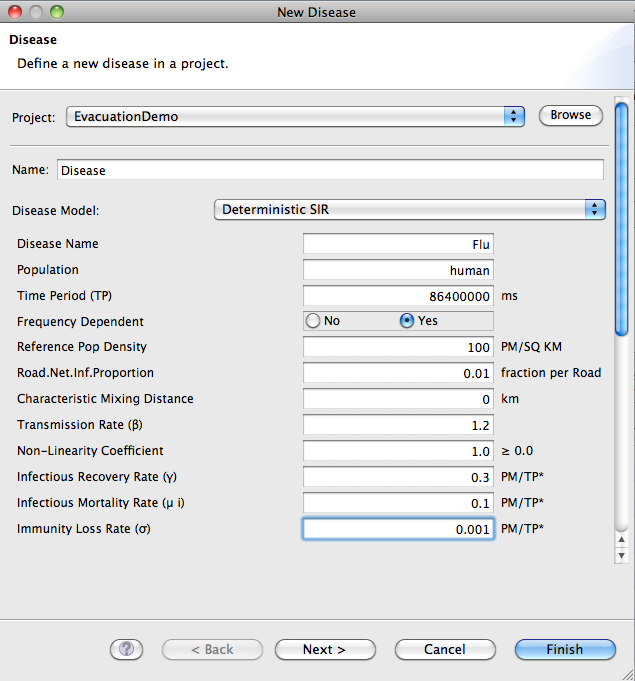 First, create a scenario (EvacuationDemo) and then three models named EvacuationGeography, EvacuationDisease and EvacuationPopulation. 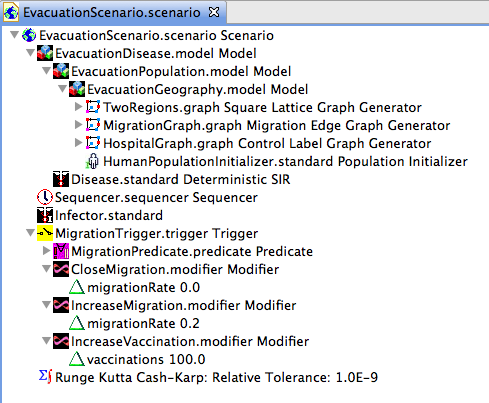 EvacuationGeography contains all the geographic data (square regions, migration edges) as well as the hospital graph. EvacuationPopulation will contain EvacuationGeography as well as a background model for the human population (background births and death rates). EvacuationDisease will contain EvacuationPopulation and the disease model itself. 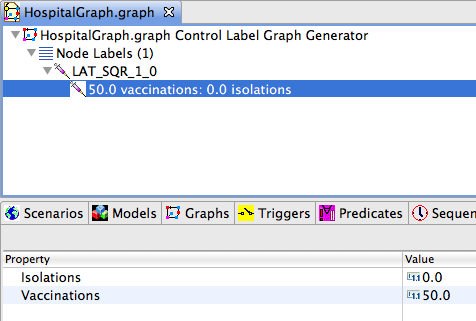 Expand HospitalGraph in the editor a navigate down to the item for vaccinations/isolations. Use the property sheet to change the vaccinations to 50 and then save the graph. Drag HospitalGraph into the HospitalGeography. Next we need a background model for the human population (background birth/death rate). 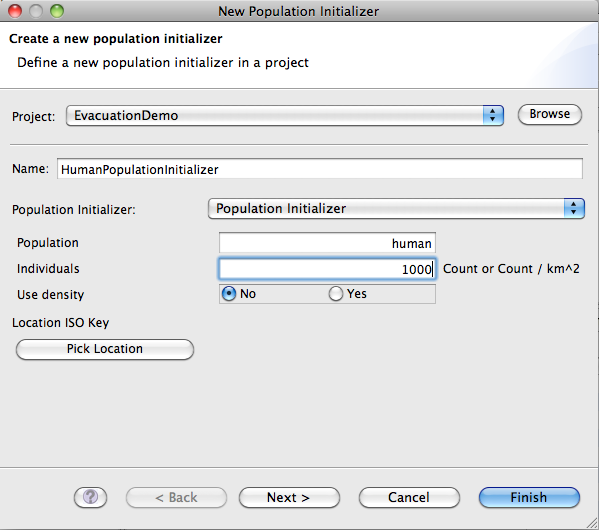 Use the "Define a new Population Model" button in the toolbar to create a new instance of a Standard Population Model (named HumanPopulationModel). Set the background birth rate and mortality rate to any values you like. I'm leaving them at 0. You can run this scenario and you'll notice how the disease spreads (via migration) from the infected region to the non-infected region. Now we want to implement the intervention. 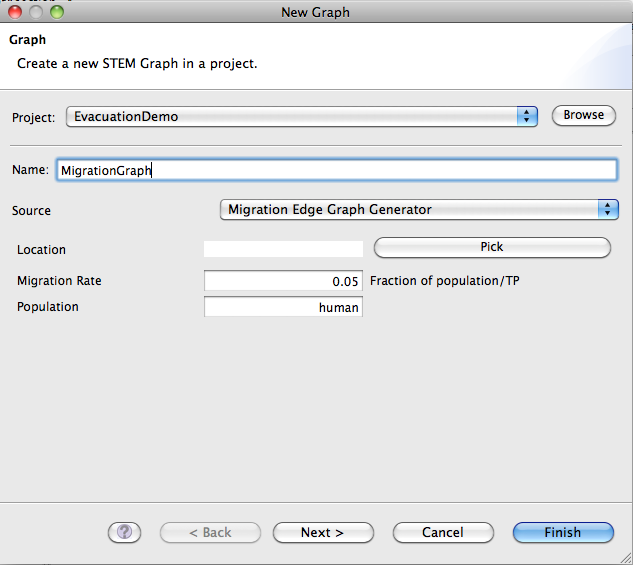 Create a new Trigger ('MigrationTrigger') and a new Predicate ('MigrationPredicate'). 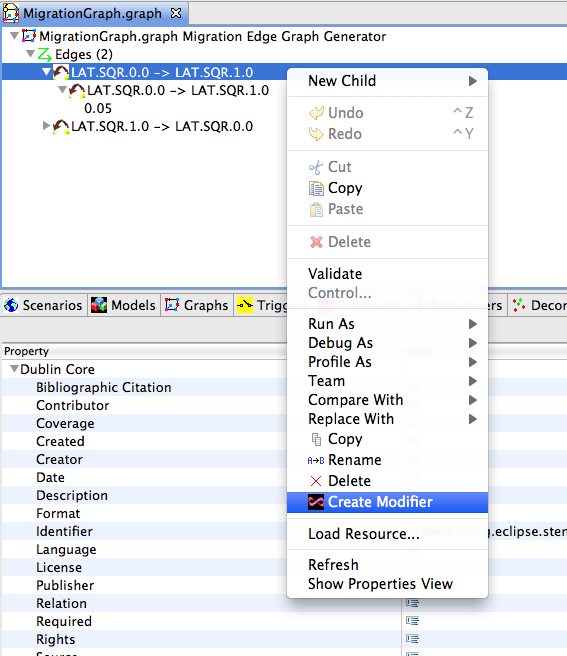 Right-click on the new predicate and select "Add Child", then "Label Value Test". (the TargetURI contains a part that is auto-generated. If you open your square graph (TwoRegions.graph) then select the LAT_SQR_0_0 node you'll find the correct URI to use under the Identifier in the Dublin Core). Drag the new predicate into the trigger you just created. Controlling an outbreak by shutting down air transportation out and in of a region is one option a policy maker can decide to do. To model this in STEM, you can can create a modifier that changes the total number of passengers traveling to/from a region. It is possible to shut down traffic at any regional administrative level. For instance, you can shut down all air traffic traveling to/from Santa Clara county in California, or you can decide to shut down air traffic to/from California to other states, or even shut down all international travel. 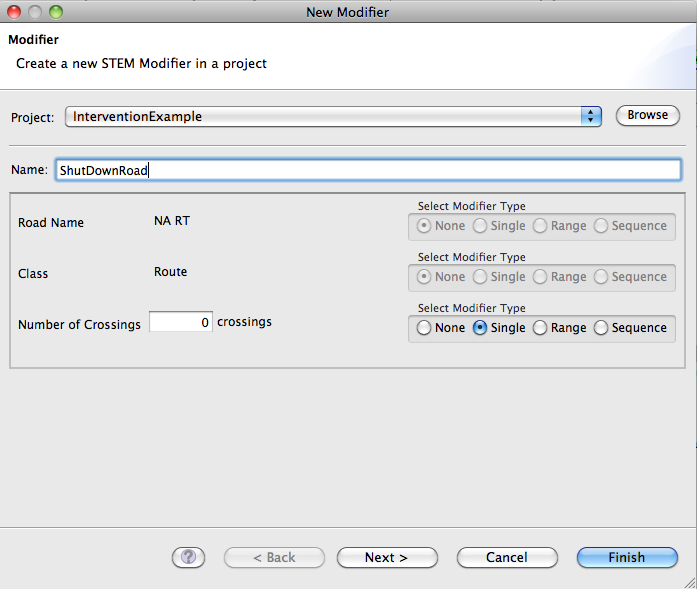 You shut down air traffic by modifying the "maxFlow" parameter of the air transportation edges. In this example, let's say we already have a scenario of an outbreak occurring in Sweden, starting in Stockholm and spreading via air transportation only to other counties in Sweden. In this case, we want to shut down all air traffic in and out of Stockholm 3 days after the first case is detected. Open up the air transportation graph in your scenario and locate the edge (under Edges) with the title "Stockholm -> (S)Sweden". This is the edge that represents all passengers traveling from Stockholm in a day. 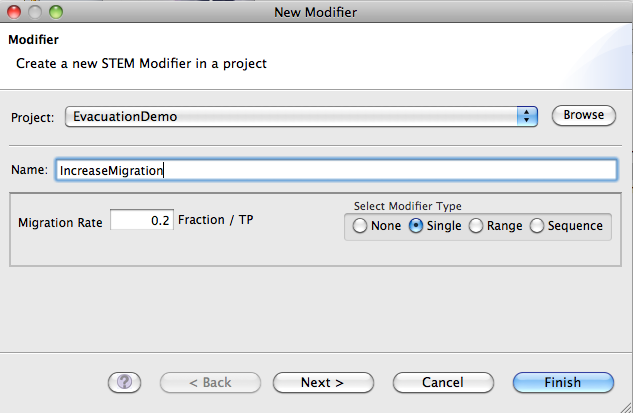 Right-click on the edge (or the edge label underneath) and select "Create Modifier". The incidence peaks about 8 days later in Norrbotten when air transportation is shut down. To shut down say all air transportation in and out of California, you can modify the two edges named "(S)USA -> (S)CA" and "(S)CA ->(S)USA" in the air transportation graph for the United States. This will effectively prevent people in California from mixing with air travel passengers in other states. However, people in California are still mixing via air transportation for flight departing and arriving within California. To shut down all air transportation in the state, you need to create modifiers for all air transportation edges arriving or departing in a California county. To shut down international air transportation, look for the edges that have the "(S)ZZZ" inside their names. Those control international passenger traffic. You shut down traffic by setting the "Number of Crossings" attribute to 0. Alternatively you can increase traffic by setting this attribute higher than 1. 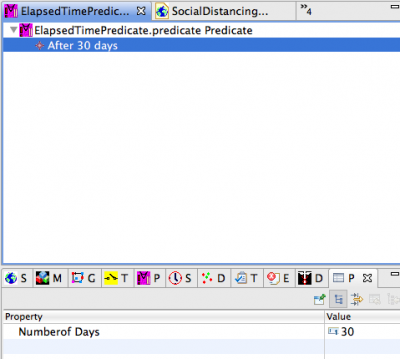 Elapsed Time Test - Used to modify some aspect of a scenario after a given period of time has elapsed in a simulation. Vaccinations - The total number of vaccinations carried out in a region in a time period. The time period is the period specified in the disease model (i.e. the same time period used for rate parameters). Isolations - The total number of patients isolated in a region in a time period. You have the option of entering values for the Fraction vaccinated and Fraction isolated. 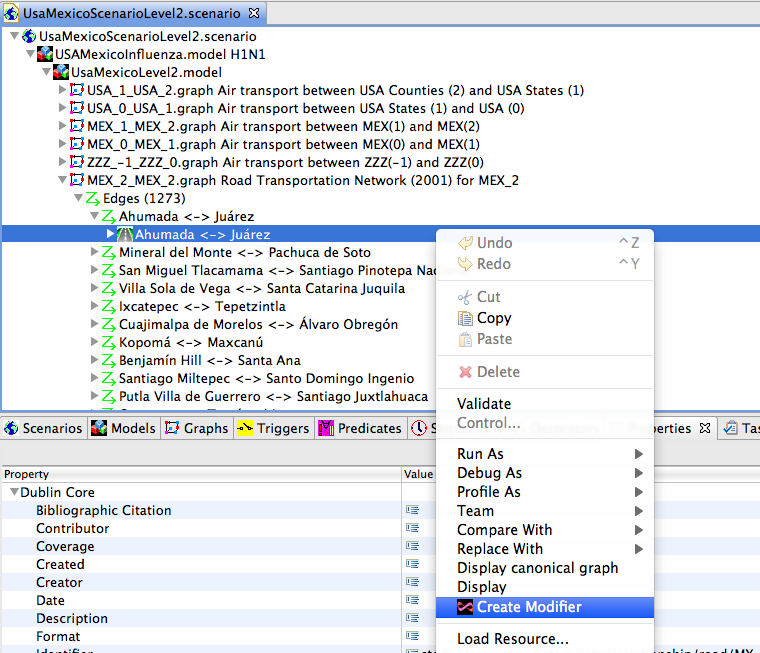 It is assumed that your project already has a model containing regional population graphs with population data. The new control graph will contain intervention labels for each region that exist in any model of your project, and the number of vaccinations/isolations in each region is the local population scaled by the fractions specified. 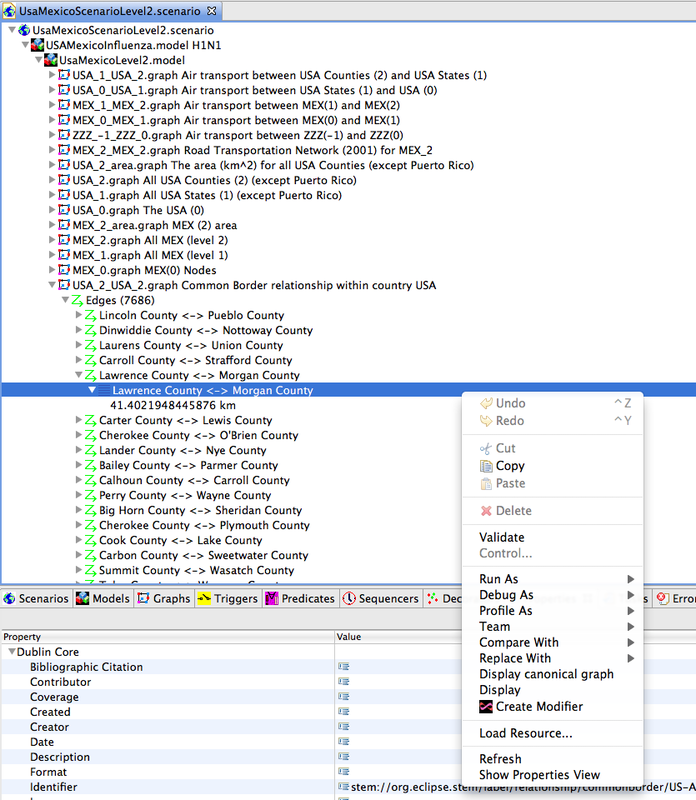 If you only want to create a control graph for a subset of the regions in your model, you can pick a location and intervention labels will only be created for that region and any regions contained within. For now, we will keep the Vaccinated and Isolated fractions as 0 meaning that no intervention are in place initially. We will change this later by a trigger in our scenario. Give the new control graph a name (e.g. 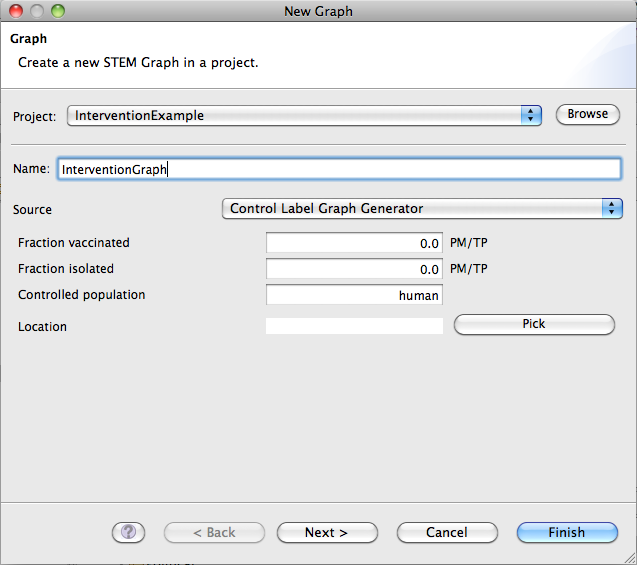 InterventionGraph) and click 'Finish'. Ignore any warning messages that show up here. The new predicate aggregates the total incidence in all of Malaysia and when it goes above 100 total cases per day the predicate is satisfied and modifications are triggered. We want to implement a mass vaccination program, and to do this we increase the vaccination rate in each of the 15 regions from the current value of 0 to 10,000 (in reality the number should match the actual capacity which depends on the number of hospitals and clinics available in each region). 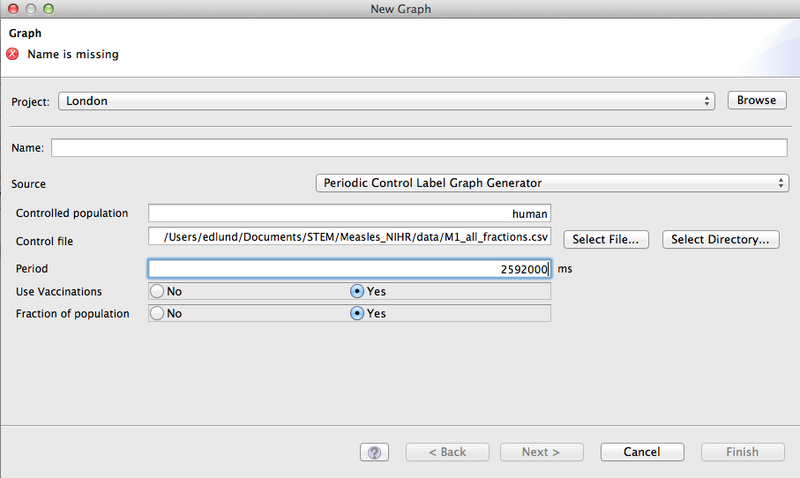 We create 15 new modifiers for the vaccination labels in our InterventionGraph.graph file. 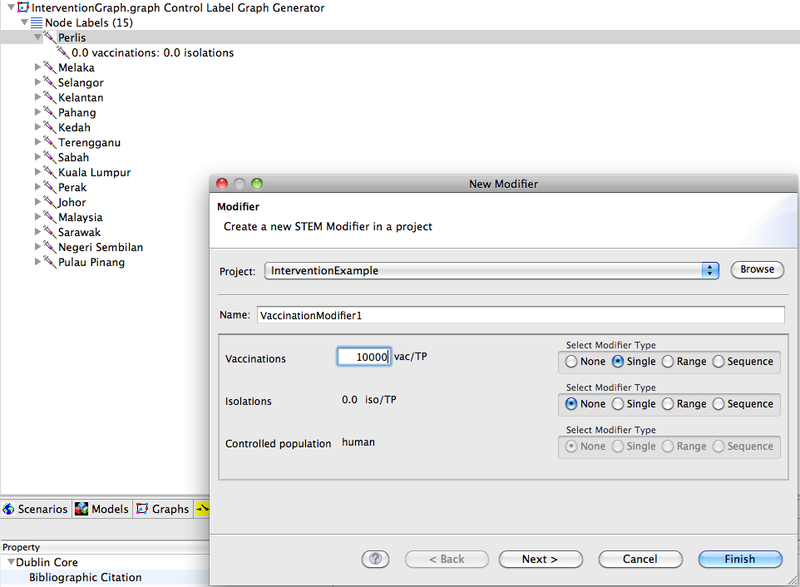 Open the file in the editor, right click on the vaccination label (one at a time) then select "New Modifier". Give it a name, e.g. 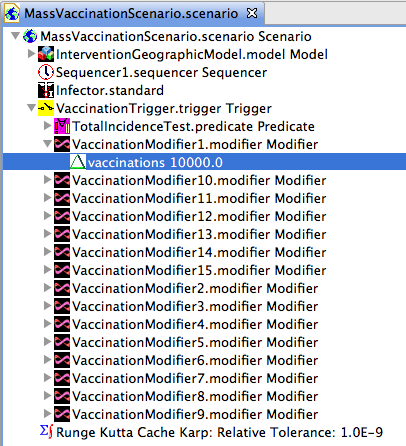 'VaccinationModifier1", select Modifier type as 'Single' then enter 10000 for the number of vaccinations. Click finish. Repeat 15 times for each vaccination label in Malaysia. Finally, create a new Trigger (using the New Trigger button in the toolbar), drag your predicate and the 15 modifiers into the trigger, then drag the trigger into your scenario. You can evacuate people from a region by modifying the rate at which people migrate to other regions. In this example, we will outline the steps to recreate the example scenario you can download here: []. The scenario contains two regions (simple square regions generated by the graph generator) connected via migration edges. One of the regions has a hospital, and a disease outbreak occurs in the region without a hospital. When the daily incidence reaches a critical threshold, the migration rate to the hospital increases and the migration rate to the infected region is set to 0. Also, the daily vaccination rate at the hospital is increased from 50 to 100 vaccinations / day. You'll notice how the model scenario has the graph with air travel data for Sweden. It's the edges (and associated edge labels) you want to modify to shut down air transportation. Create a trigger (using the "New Trigger" icon in the toolbar) and give it a name, e.g. "AirTransportTrigger". Next, create a new Predicate that is true after 3 days of elapsed simulation time and drag it into your trigger (see first tutorial above if you need more information). The wizard for creating a new modifier pops up. Give the new modifier a name, e.g. 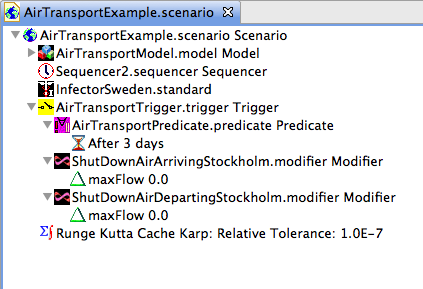 "ShutDownAirArrivingStockholm" and select "Single" for "Modifier Type", then enter 0 for "Max flow". This will effectively shut down all passengers leaving Stockholm via air transportation. Now we need to also shut down all passengers arriving to Stockholm. 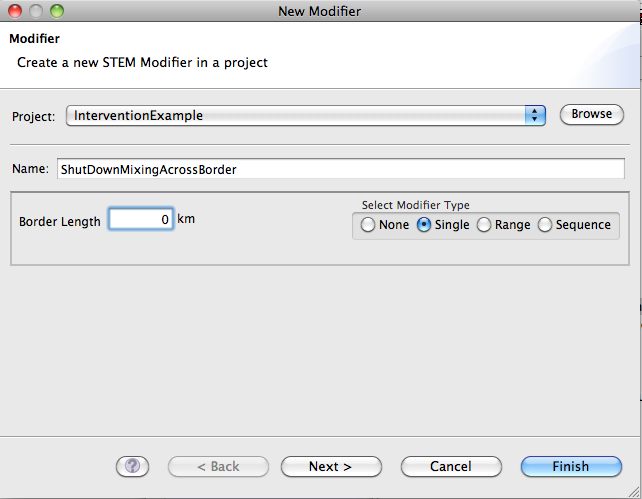 Locate the edge with the name "(S)Sweden -> Stockholm" and repeat the process above to create a new modifier name e.g. 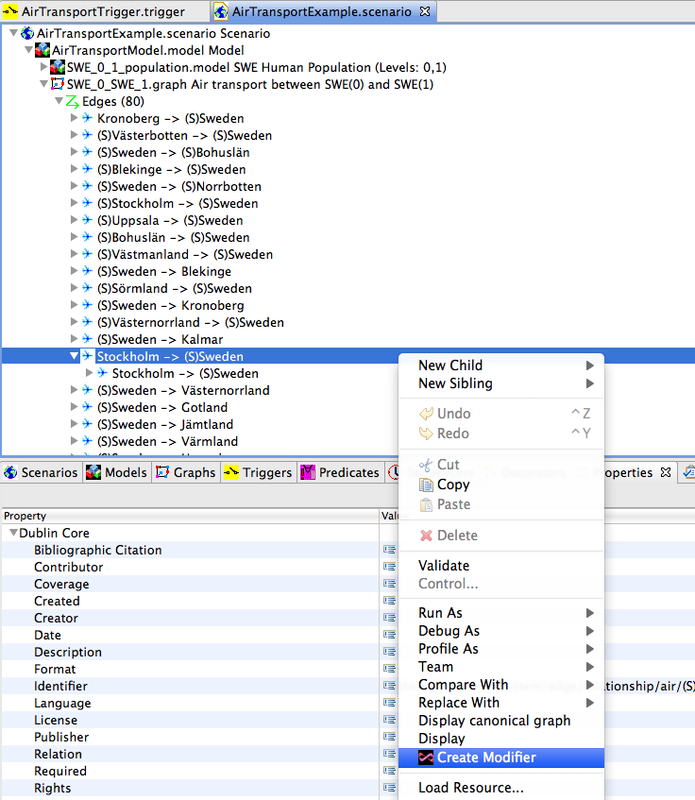 "ShutDownAirTrafficDepartingStockholm" setting maxFlow to 0. Drag the two new modifiers into your trigger and drag the trigger into your scenario.